First off, this review is way outside of what we usually cover here, but I was so impressed with the results of a recent upgrade for my bike that I couldn’t help myself. So, having warned you – let’s dig in. While planning a full group set upgrade for my 2015 Trek Domane, I discovered that Trek does their own thing when it comes to press fit bottom brackets. So, I could either leave the stock BB90 bearings in place, or replace them while I was messing around down there – which meant there was really ever only one way it was going to play out. 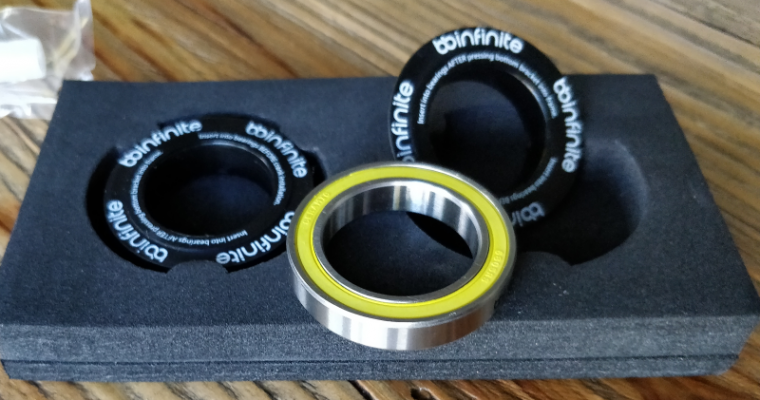 There are a lot of options out there for BB90 bearings, but I opt’d to go with the BBInfinite Ceramitech kit because of some pretty compelling videos comparing their bottom brackets to Shimano. I was a bit concerned with the removal and installation of the bearing, but that turned out to be straightforward with the Park Tools BBT-90.3 (removal) and BBInfinite Master Tool Set MTS1-01-SS (installation). The BBInfinite press can also be used to remove bearings, but I was more comfortable using a specialized tool for the job, and I don’t have an air hammer. The only complexity in the process was that BBInfinite doesn’t provide the best set of installation instructions; so I ended up calling them to confirm that the black plastic bearing covers should be inserted into the bearings after pressing. Now, obviously this isn’t a very scientific type test, and there are a lot of variables that aren’t accounted for; like different crank set, weight, size, etc. I made the videos for my benefit, so I could visually compare any before/after differences to see if the $120 spent on the replacement was useful. It was only after doing that I decided to write about it, because of the massive reduction in drive train drag that is obvious after the change. Also, it is unfortunate that replacing press fit bearings is a destructive process, because I would love to know whether the $60 steel version of the bearing would produce the same result :). Of course, as a consumable good, perhaps when it’s time to replace the bearings again I might just take a chance and save $60. The difference in the video is impressive, I wonder what the change in watts is between the two setups. For longer rides, it could make quite a difference. I current have a Giant Anyroad with 105’s and I’m pondering if this might be a good project from over the winter. The spec on my bike is “Shimano press fit”. Did you buy the tools for this job specially, or did you already have them lying around? You should love the Tiagra to Ultegra upgrade – I really want to go SRAM Red Etap – but $$$$. I wish I had the tools to measure that, I’m sure the reduction in drive train loss is massive. BBInfinite makes a Shimano press fit kit as well. Found a couple of videos of that kit; theirs – https://www.youtube.com/watch?v=YpsCpp8YlnM 3rd party – https://www.youtube.com/watch?v=35EAnX0V8cE (this is the one that tipped the scaled to the ceramic bearing). Depending on the mileage on your crank, you might be due a bearing swap anyway. Certainly no harm in doing a spin test to see how your current setup performs. I bought the two tools mentioned above just for this project, and a few others (e.g. bike specific torque wrench) for the group set upgrade. The other stuff (e.g. workstand) I already had because I service my bikes myself. I opted to buy the bearing press because I can see myself using it again for this, and other bikes, but you can rent it from them for $15 as well – which is great. Rental is a great idea. I’ve started working more on the bike, but really should do more if I can. I do need a good torque wrench and stand (I’ve been using my hitch rack). Again, probably this winter. A quick search suggests you can gain 10 to 15 watts, which is huge. Of course this number is from a seller of bearing upgrades – but if even on the lower end, a good number. Enjoy the upgrades. Hitch rack is a great idea. As long as it’s secure and you can move around the bike, not sure a work stand would add much. I didn’t used to service our bikes, but I got sick of paying [a lot] and being without my bike for a few days for something that I can do. Doesn’t take long to get ROI. 10-15W! Should have done it a long time ago :).